The TAB field trip is a highly anticipated event by the TAB community and paid for by the Friends of the Arlington Public Library. 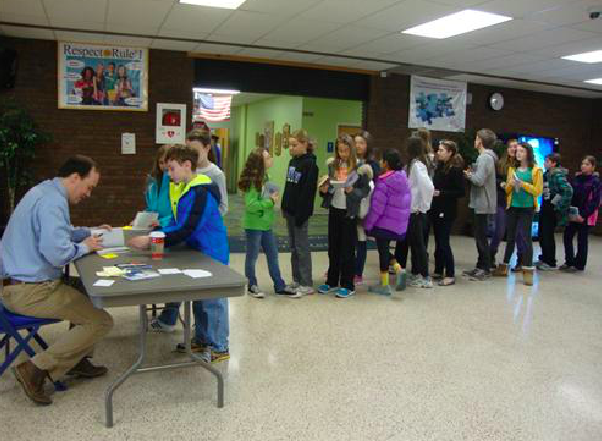 TAB groups from each of the middle schools gather in one place for an author visit. 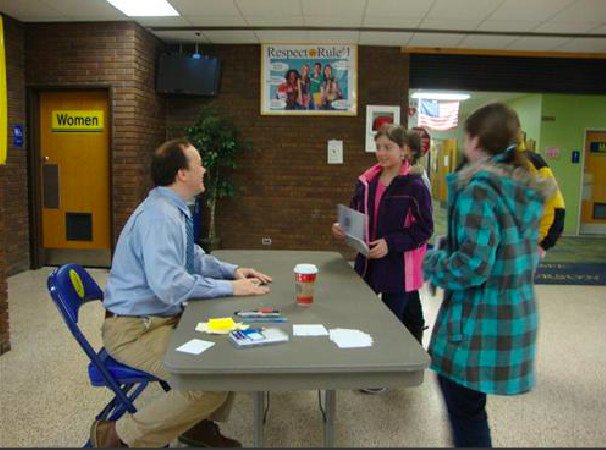 In preparation, students are given a copy of one of the author’s more recent books to read before the visit and to have signed at the visit. Stuart Gibbs is a fan favorite of WMS students. He is know for the Spy School Series, the Funjungle Series, and the Moon Base Alpha series. He Skyped with TAB students during 8th grade lunch. 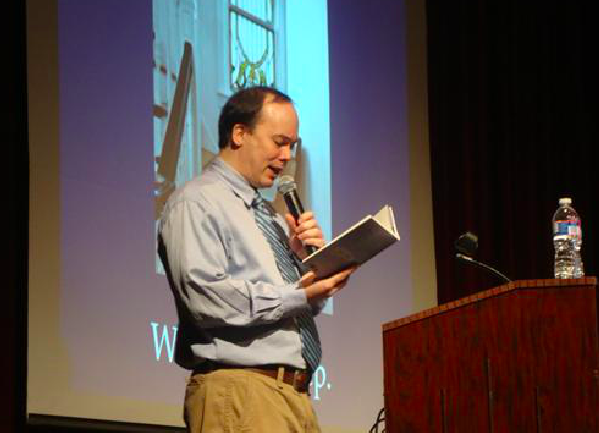 His advice to writers: write, read, be curious, be resilient. Gunston Middle School hosted this All TAB field trip. 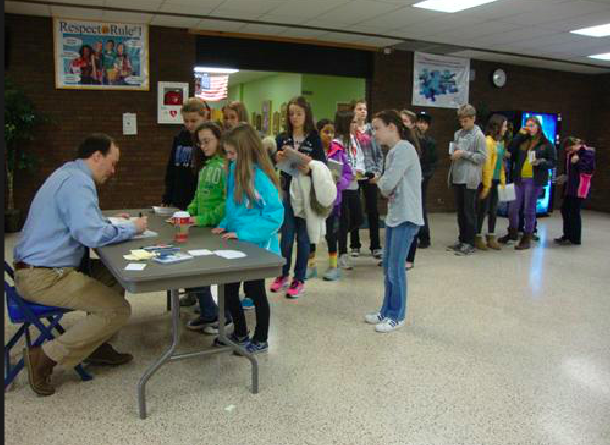 TAB students received a copy of All’s Faire in Middle School prior to the author visit and brought it to the event to be personalized and signed by the author. Ms. Jamieson said that aspiring author/illustrators should think about something they love for inspiration and/or take real life experiences and fictionalize them. Donna Freitas is the author of Unplugged (TAB 2016-2017) and The Body Market (TAB 2017-2018). We had a Skype visit with her in the library nook during 8th grade lunch and invited all TAB member to come. Ms. Freitas spoke to our students for nearly an hour answering specific questions about her books as well as more general questions about writing. She said her friends recognize themselves in some of her book characters, and novels are a way of having a “do-over” for some life events. Students read Prophecy before this visit with Ellen Oh. Ellen Oh is the CEO and president of We Need Diverse Books. She shared important information about how book covers are “whitewashed” meaning a photograph on the cover depicting the main character is often of a white person regardless of whether or not the main character is, or artwork that doesn’t show people is used to gloss over ethnicity. She also talked about the inspiration for her books and the writing process. 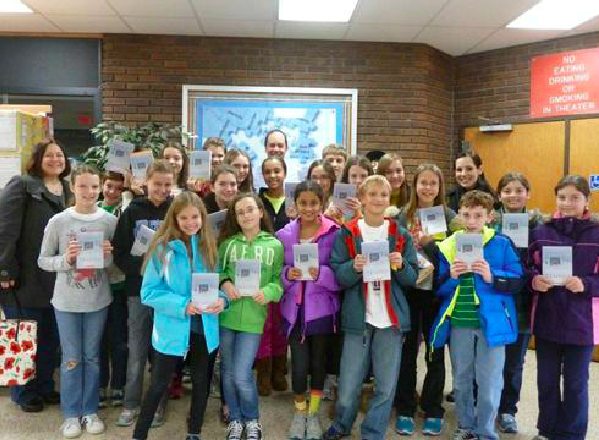 Students read Cinder before this visit with Marissa Meyer. Marissa Meyer told a good story about how she became a writer. She started out by writing Sailor Moon fan fiction. She talked about her love of fairytales. She so loved Disney’s The Little Mermaid that she said, “You couldn’t get me near a sink without me breaking into song.” Cinder has been optioned for a movie. I think there is a happy ending to all of this, but somehow it didn’t get recorded. I think I was laughing too hard.